Want to fit lowered springs to your car? Here is your one-stop how-to guide! One of the most popular vehicle mods is the fitment of lowered springs. 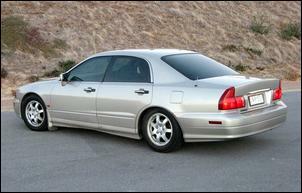 Lowering your car improves aesthetics and can give improved handling. But how do you lower your car without sacrificing ride quality and ground clearance? Well, that’s the big question – and one we’ll answer through the course of this article. 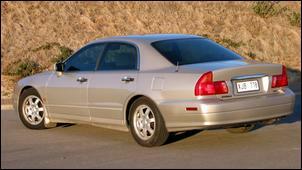 The demo car for this feature is our newly acquired 1997 Mitsubishi Verada V6. The factory springs had been chopped by a previous owner and the resulting ground clearance was abysmal. Our aim was to install a new set of springs that gave a lower than standard ride height but with acceptable levels of ground clearance and ride comfort. A firm-ish spring rate was also required to aid handling. 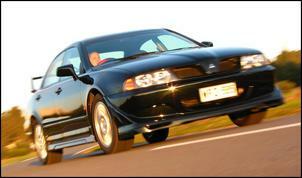 In the case of the Verada, a firmer and lower pair of rear springs was available from the Magna Sports/Verada GTV. Unfortunately, these springs are only s-l-i-g-h-t-l-y uprated compared to the Verada and the difference wasn’t enough for us to justify their purchase. The next option was a set of Ralliart Magna springs. Again, these are only marginally lower than standard but, based on our drives of the Ralliart Magna, the spring rate is suitably firmer. Ralliart springs were seriously considered for our Verada but we couldn’t find any second-hand and they’re quite expensive to purchase new. So an aftermarket set of springs was what we needed. The Mitsubishi Magna/Verada, like comparable Holden and Ford models, is supported by a wide selection of aftermarket springs. 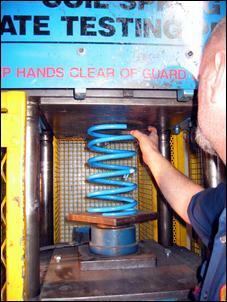 Manufacturers such as Lovells, King and Whiteline offer springs to suit. But how do you choose? 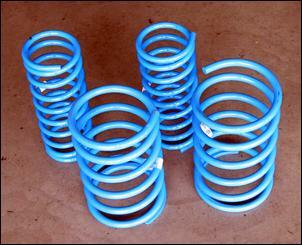 Well, first, we’ve gotta tell you how not to choose springs. Asking for advice on web forums is risky business. ‘Acceptable’ levels of ground clearance and ride comfort vary hugely and what you might consider bone-rattling someone else might consider fine... And there are plenty of other variables including the performance of the vehicle’s dampers, local road conditions, wheel/tyre size and vehicle weight. You have been warned! The best place to start is to check out the existing springs. The first consideration is ride height. It’s common for aftermarket spring manufacturers to quote approximately how much lower your car will sit after their springs have been fitted so, if you have any concern about ground clearance, it’s important to know the starting height. 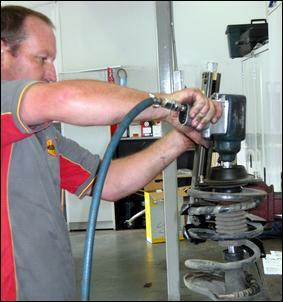 Typically, ride height is measured from the centre of the wheel to the lip of the guard – this eliminates any variations caused by altered wheel/tyre diameter. 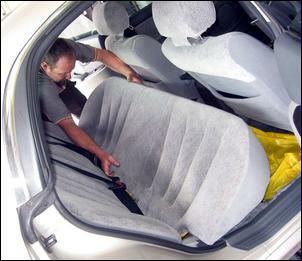 Using this method of measurement, the ride height of most large passenger cars varies between around 370mm and 430mm. 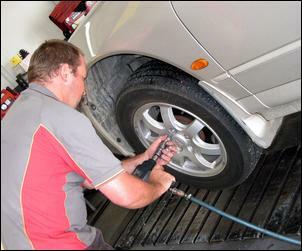 Determining the rate (firmness) of your car’s existing springs isn’t as easy. 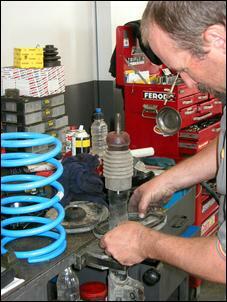 If possible, we recommend removing the springs from the vehicle and having them tested on a spring rate testing press. As seen here, a spring rate press compresses the spring using a hydraulic ram and the spring rate (expressed in pounds per inch or kilograms per millimeter) is shown on a digital display. A higher number means a firmer spring rate. In the case of our Verada, the standard spring specifications were available through an aftermarket spring manufacturer and Mitsubishi Australia. The Verada’s standard front springs are listed at 140lb/in while the rears are very soft at just 110lb/in – no wonder they’re always bum-down when towing! 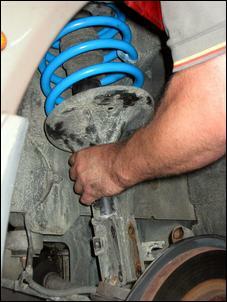 So now you know the ride height and rate of your existing springs – now what? The next step is to plough through manufacturer information to find the springs that deliver a ride height that’s within your desired range. For the Verada we wanted a subtly lowered ride height and there were a few ‘30mm lowered’ springs that caught our eye. With a shortlist of lowered springs, you can select the most attractive set based on spring rate and the resulting ride characteristics. 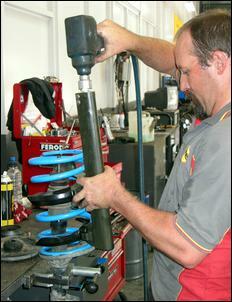 In some instances, aftermarket manufacturers will provide you with the rate of their springs. Alternatively, you can have them tested on a spring rate press or you can use the spring rate comparison formula to rank the springs in order of firmness. In our case, we chose a set of Lovells 30mm lowered springs. The manufacturer told us the front springs are rated at 166lb/in while the rears are 140lb/in – interestingly, this is almost identical to the spring rate of the Ralliart Magna (which we know has an acceptable ride). A few minutes on the spring rate press showed this particular set of Lovells springs to deliver 175lb/in and 155lb/in front and rear respectively. Note that this is the maximum recorded spring rate which is achieved near the end of compression – the first couple of inches travels have a softer rate (as we’ll discuss in a moment). Purchased through Phillcom Rally (www.phillcomrally.com), the set of four Lovells springs cost AUD$225. This undercuts many other brands which are closer to AUD$300. Phillcom Rally also offers installation through Midas at Thebarton (South Australia) for a special price of just AUD$150 – why bother trying to do it at home without a hoist? 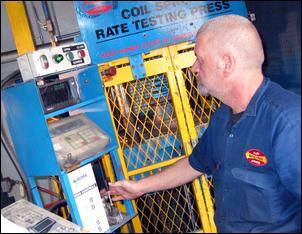 A spring rate testing machine is a hydraulic press equipped with a load cell that sends information to a digital screen. The operator has a joystick to control the vertical movement of the hydraulic ram and there are a couple of buttons which lock and unlock the access door. Note that the press and spring are securely contained in a mesh cage - the energy stored in a compressed spring is potentially lethal. 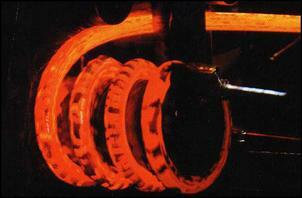 The test spring is installed into the press between the top mounting surface and the lower ram platform. If necessary, steel wedges are used to keep the spring vertical - the spring cannot be tested while sitting at an angle. The operator will use the ram to apply some preload to the spring before testing commences. 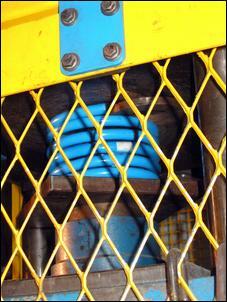 Depending on the size of spring, preload is typically 100lb. From its preload position, the operator will then compress the spring in one inch increments and record the force shown on the digital display. The spring is compressed as far as possible before the coils start to bind. In the case of the Lovells springs, we were able to take measurements across five inches of travel. The front Lovells springs gave 130 – 135lb/in over the first thee inches of travel increasing to 150 and 150lb/in in the fourth and fifth inch of travel. The rear springs gave 155lb/in over the first three inches of travel increasing to 175lb/in over the fourth and fifth inch of travel. This is slightly softer than claimed for the front and slightly firmer than claimed for the rear. 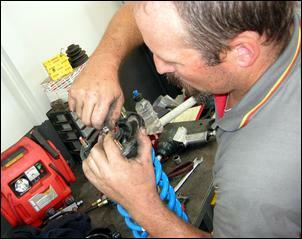 In South Australia, we had our spring rates tested by Industrial Springs. Cost is just AUD$10 for a pair of springs. 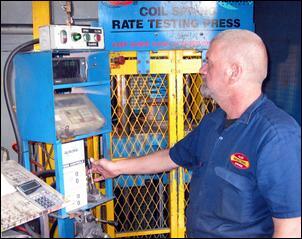 For a spring rate test press in your local area, we suggest contacting aftermarket spring manufacturers. Installation begins by raising the vehicle on a hoist and removing the wheels. 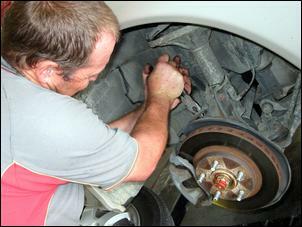 Starting at the front, the brake line retainer is removed and the two lower bolts that secure the strut to the hub are removed. The nuts holding the top of the strut to the body are now removed from inside the engine bay. 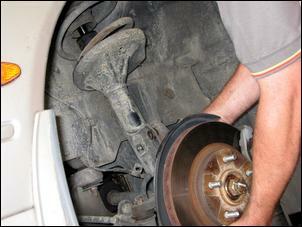 With the upper and lower strut mounts removed, the strut can be withdrawn from the car. 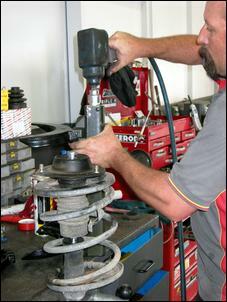 The strut is secured in a vice and the first step in disassembly is to compress the spring. 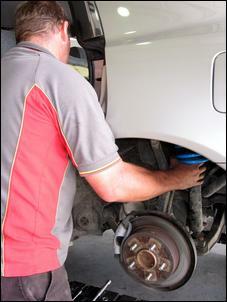 This is achieved with a heavy-duty spring compressor tool which is driven by a rattle gun. Once the spring compressor tool has removed spring tension against the upper spring mount, the top strut assembly can be removed. The front struts of the Verada have a rotating top assembly which contains a bearing. 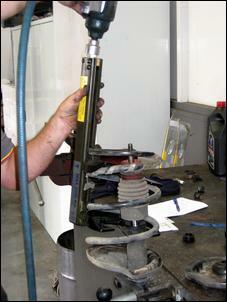 This top assembly and upper spring mount can be removed after removing a central nut at the top of the strut. This photo shows the strut minus the top assembly and upper spring mount. The rattle gun is being used to release the spring to its free length. With the existing spring removed, the upper and lower spring mounting surfaces (including rubber isolators) should be cleaned. The new springs can now be dropped onto the strut paying attention there may be different springs specified from left to right. The spring compressor reduces the height of the new spring to allow reinstallation of the upper spring mount and top assembly. Once reassembled, the strut can be refitted to the car. 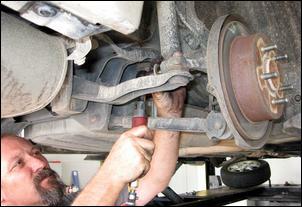 Make sure the upper and lower strut mounts are tightened to the specified torque. The brake line retainer is also reinstalled. The front wheels are now refitted – and the front is complete. With attention now turned to the rear, the back seat of the Verada must be removed to give access to the upper strut mounting nuts. 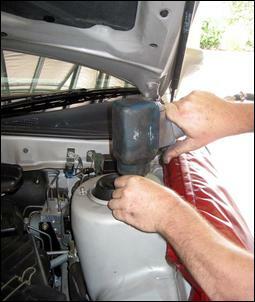 On the Veraada, the bottom of the rear strut is released by removing a single bolt. 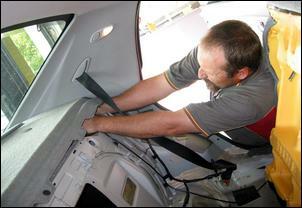 With the upper and lower mounts removed, the strut can be maneuvered from the vehicle. In this case, a single nut holds the upper spring mount to top of the strut. 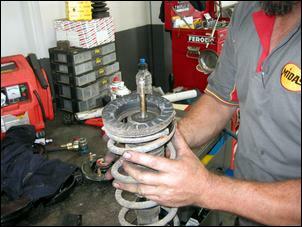 This nut is removed with a rattle gun to allow removal of the upper spring mount and spring. With the strut mounting surfaces cleaned and the new spring fitted, the upper spring mount can be reinstalled by tightening the upper retaining nut. The rear strut can now be reinstalled to the vehicle. The upper strut mounting nuts are fitted followed by the lower mount. Each is then tightened to the specified torque. The back seat and wheels are now refitted and the job is done. 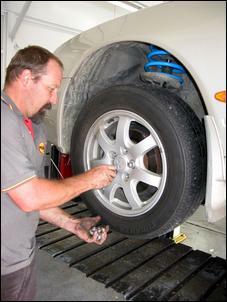 Note that a wheel alignment is recommended to reestablish camber and toe angles. 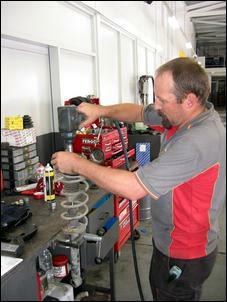 After doing our research, we’re happy to say that the Verada’s new springs are exactly what we were after. These photos compare the ride height achieved with the previous chopped springs and our new Lovells springs. As you can see, ground clearance is improved and, using the measurement from the centre of the wheel to the lip of the guard, the front and rear now sit at around 365mm front and rear – up from 360mm and 315mm (respectively) with the chopped springs. The front mud-flaps occasionally scrape over giant speed humps but we haven’t found any other problems. The ride is obviously firmer than standard but it’s in the same ballpark as, say, a Ralliart Magna or SS Commodore. Perfectly within our range of acceptance. The dampers are also able to maintain decent spring control – though, even with standard springs, the Verada suspension feels a bit soft in damping. Handling? Well, compared to a standard Verada there’s less roll through corners which improves feel and reduces understeer (in dry conditions, anyway). Pitch and dive is also much reduced under hard acceleration and braking. So there you have it - fitting lowered springs can cause problems if you leap into it, but when you do some homework you’re almost assured a positive result!